CEVA LAUNCHES FIRST FDA-APPROVED GENERIC OF MILBEMYCIN OXIME IN U.S.
Ceva Animal Health has launched MilbeGuard™ (milbemycin oxime) Flavored Tablets, the first FDA-approved generic milbemycin oxime in the U.S.
whipworms (in dogs only), hookworms and roundworms. 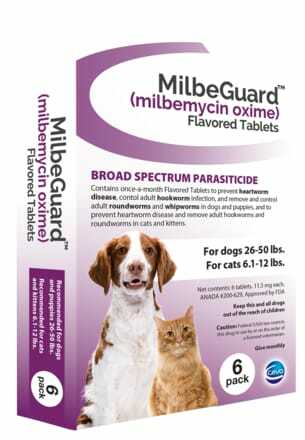 The active ingredient, milbemycin oxime, has been trusted by veterinarians to control heartworm for years. “There are trusted and effective molecules available that can prevent the increased rates of heartworm disease. With the launch of MilbeGuard, more dogs and cats should be protected so we can reduce heartworm incidence,” said Dr. Edward M. Wakem, Ceva Veterinary Services Manager. To learn more about MilbeGuard, talk with your Ceva sales representative or visit www.MilbeGuard.com. IMPORTANT SAFETY INFORMATION - Dogs and cats should be tested for heartworm prior to use. In a small percentage of treated dogs, digestive and neurologic side effects may occur. Safety in heartworm-positive cats has not been established. Safety in breeding, pregnant, and lactating queens and breeding toms has not been established. In cats, safety studies up to 10 times the label dose did not detect any adverse drug reactions. See attached product label for complete safety information. The heartworm preventive you trust is not available at the right price https:// heartwormsociety.org/newsroom/in-the-news/347-ahs-announces-ﬁndings-of-new-heartworm-incidencesurvey. Accessed 26 July 2017.